Finally, after what feels like forever, my doctor cleared me to drive again! Hooray! 🙂 That means my seizures have been under control (medically, blech) for long enough that I am once again considered a safe driver. Yay me! I love to write. I love to write using purple ink pens. 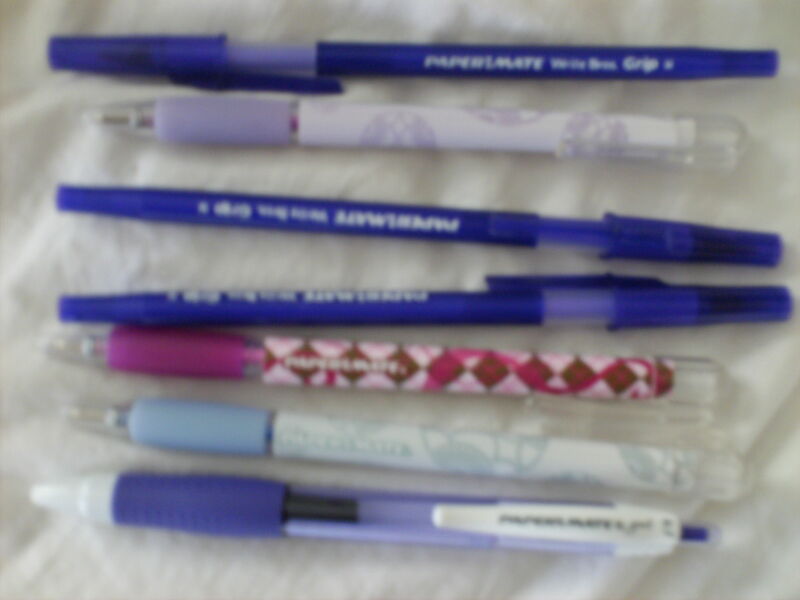 Sadly, those nifty purple ink pens tend to be disposable, not reusable. This has inspired much guilt. However, I have recently discovered a way to alleviate this problem, maybe. In lieu of simply tossing away my dinky little pens, I can recycle them! 1. Sign up at the TerraCycle site to be the leader of the Writing Instrument Brigade (or any of the other Brigades–there are many). 2. Gather empty, unusable pens/markers/etc and partner with a charity/school. 3. Send the writing instruments in to TerraCycle, using the pre-paid shipping labels they provide. TerraCycle then sends $.02 per acceptable writing instrument to the 501(c)(3) organization. –Finding esoteric reading material and taking the time to make use of it. Ken Griffey, Jr is so totally the man: He’s reached this milestone without being a jerk and a druggie. I’m so happy for him that he’s done this. Taking the time to really enjoy the company of a truly good person. Taking the time to truly enjoy a moment before it’s gone. Just in case any of you were wondering, yes, I did complete 2009’s National Novel Writing Month. Hooray! It was one of the most liberating, frustrating, and enjoyable things I have ever done. I wrote a novel–beginning to end–in one month, and it turned out rather well. Yes, I was surprised by that, too. I took an idea that I got from talking with a friend of mine, and from a tragedy that happened to someone I knew. It was not an auspicious start to a novel, but it turned into something fascinating, and slightly trippy, and wonderful–despite its mood whiplash. Also, I tried out a creativity exercise that I had read in Writer’s Digest’s Creativity Workbook. It came out at the absolute perfect time for me. I love writing exercises, and I try to do several each week. This one involved writing down six “To Do” lists for one character, to better flesh out the character. He turned out to be one of my favorites. I just finished my recent copy of The Week. (It’s one of the best investments that I’ve ever made.) Near the end of the magazine (right before the page of games that is the last page), they run an essay entitled The Last Word. Now, in The Last Word, the editors of The Week have placed some really fun essays–one about a mom who let her kid ride the NYC subway home alone (and yes, the kid turned out fine), one about why folks have trouble with spouses (there have actually been a few of those; must be a recurring problem), etc. In this last issue, their Last Word essay is all about one man’s quest to understand the concept of Radical Honesty and use it in his life, if possible. Radical Honesty is a…well…radical concept. The basis of the idea is a theory posited by Brad Blanton–he doesn’t want us simply not to lie, he wants us to eliminate the “public filter” that we have imposed upon ourselves in polite society. In his eyes, everyone in this world should say everything we think–whether it is hateful or loving, hurtful or healing or neutral. No matter the immediate cost to ourselves, we should be completely honest with each other because Blanton thinks that only then will we be able to really “contribute” to other people’s beings. We create little (sometimes big) fictions not just to keep ourselves safe, but to protect those around us as well. Imagine telling your mother that you think she is horrendously obese. Or telling your dad that you think he is a shiftless moron. These things hurt people. Once you have said something, you can never ever really take it back. It’s always in the air like smog in LA. Even if you cannot see it all the time, the echoes of those words will not completely fade away. They will sit there, biding their time, until they catch you unaware–maybe it is a great day for you, otherwise; maybe it has been the worst day of the year–and punch you in the gut. Not only does Radical Honesty have the likelihood of emotionally maiming the people at whom it is aimed, it also contains the potential to harm the one doing the directing. Yes, honesty is touted as the best policy–and it certainly keeps things simple–but is it truly the best possible option? Always? Granted, telling your best friend that she has gained some weight may coerce her into going to the gym, but being super-blunt about it could wreck the friendship–odds are she already thinks she is fat, anyway, and your telling her this only breaks her heart, so a better option might be to talk to her about going to the gym as your workout buddy or joining you on your evening walk. …On the other hand, honesty can save you a heck of a lot of time. What if you would rather skip the boring meeting about running the copier? (Seriously? Is it that hard?) I told one of my co-workers that I would certainly not like to go to the meeting to “be taught” how to use our brand-new copier. I didn’t have to go to the teaching session, and I still have my job. You know…now that I think about it, Radical Honesty might be a pretty good idea. At least in moderation. sticks when they’ve invented the lighter? randomly switching directions on the sidewalk. ending a work email with the phrase “Regards” again. FAQ’s. We just figured it out. Today’s kids are soft. There is a great need for “sarcasm” font. Ryder BB gun that I always wanted. 546 pictures? Don’t mind if I do! to die after leaning your chair back a little too far. if I keep it on? I bet everyone is wishing we weren’t watching this. It’s only a matter of time before they all get up and leave the room. I like about one in every fifteen songs in my iTunes. <http://cnn.com/> and the link takes me to a video instead of text.